They are cute to the power five. This mini-flock all has one mum – and they all arrived in the world about 48 hours ago. 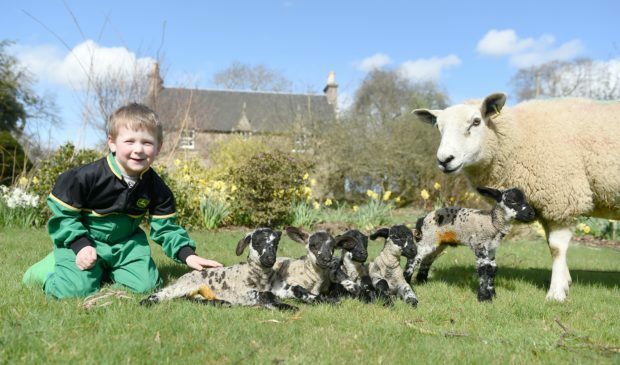 The Macarthur family were delighted to welcome a rare set of quintuplet lambs to Newton of Budgate Farm in Cawdor. The family-run farm owned by Ewen and Irene Macarthur, ably assisted by members of the family and employee Craig Aitkean. The five Suffolk cross Texel lambs are fighting fit after being born on Thursday lunchtime, with mother ewe over watching their every step. Incredibly this is the third set of quintuplets born at thefarm this year; however, unfortunately the current flock are the only full quintuplet to survive. Typically first time mothers will give birth to single lambs, however, occasionally a twin birth can occur. This is not the first time the farm has witnessed a healthy number of lambs from one ewe. Incredibly, the same situation occurred last year as well. It is estimated that only one in 5,000 ewes has the potential to carry quintuplets with the odds for all to be born fit and healthy significantly lower. On the farm the Macarthur family are currently attending to 800 ewes that have already or are in the process of lambing. Four-year-old Jamie, Miss Macarthur’s cousin, has been helping around the farm assisting with the bottle feeding of his new friends. At the last census gathered by the Scottish Government, of the 6.99million sheep currently found in Scotland, ewes are found to represent 38% of this figure, with lambs representing 49%.